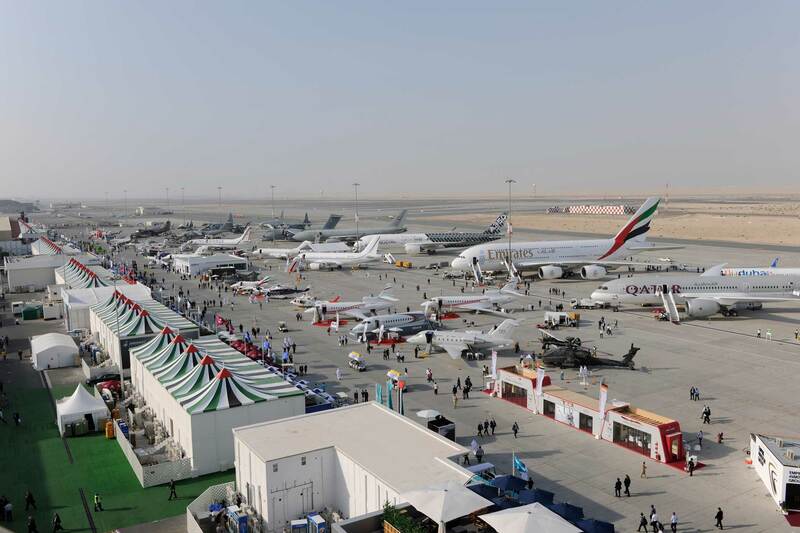 The Dubai Airshow expects to attract record exhibitor and visitor numbers, as the event takes place for the third time at the Exhibition Hall at Al Maktoum International Airport (DWC). Organizers are forecasting visitor numbers at the trade-only event to rise by 9 percent on 2015 to 72,000, joined by 1,200 exhibitors, 1,350 media representatives and 160 aircraft on display. “We are Number 3. Paris is the biggest, then Farnborough and then us. Singapore is younger than us [and claims to be bigger], but if you measure it on the number of exhibitors, square meters and visitors, it would be us as Number 3,” Michele van Akelijen, managing director of Tarsus F&E Middle East, told AIN at the MEBAA Morocco business aviation show in Marrakech in September. She asserted that orders are not necessarily a yardstick to measure the success of a show: “We have had shows with high orders and shows with low orders. [We are] more focused on creating the relationships to get those orders and…[promoting] networking in front of the right people. Dubai Airshow is the perfect platform to do that. You don’t get that opportunity on a regular basis—where everybody is in the same place at the same time,” she said. The Space Pavilion Conference takes place on November 13 and 14. Dr. Ahmad Al Falasi, UAE Minister of State for Higher Education and chairman of the UAE Space Agency, will address a morning session on November 13 on domestic space programs such as the UAE mission to Mars, while Badr Al-Olama, head of aerospace at Mubadala Development, will speak later about that company's work in the field of aviation. Two one-day conferences take place at the show on November 13. One of them is the Gulf Aviation Training Event (Gate); the other is the Cargo Zone Conference, which will debate the impact of cyber security on cargo operations, among other topics. Boeing’s market outlook for 2016-2035 predicts the Middle East will need 58,000 new pilots and 66,000 new skilled technicians to staff the region’s airlines, according to F&E Group. A pair of two-day conferences take place on November 14-15: Airport Solutions Dubai and the Unmanned Aircraft Solutions Summit. Airport construction is becoming a major market focus, and F&E Group is consolidating equipment suppliers under one roof at three global annual conferences. “We now have an Airport Solutions series of shows worldwide: one at Dubai Airshow, one in Mexico and one in Indonesia. In Dubai it’s a conference-based exhibition. When we take it abroad, it’s an actual exhibition, a proper show. It’s about the passenger experience, air traffic management and ground-handling equipment. It’s about anything and everything that goes into airport construction and refurbishment,” she said. The first Airport Solutions Global Series conference in Mexico took place earlier this year, while the Indonesian event was until this year part of the Indonesia Infrastructure Week, a spokesperson for F&E Group said. Tarsus is also understood to be considering Turkey as a venue for the event. “Research we have done shows that Mexico and Indonesia are the areas where the most airport development is happening outside the Middle East. Mexico takes place in May. Indonesia is happening this month [November],” van Akelijen said. F&E Group became a member of the Tarsus Group, an international media group, in 2007.